In August 2015, I made a return visit to north central Oregon to view field trials for expanding organic peppermint production and beginning production of echinacea, catnip and skullcap, three popular herbs that have suffered a recent decrease in domestic production. Frontier provided our Well Earth partner with funds for the trials in the spring, with harvest taking place in July and August. The trials were on 102 acres of land recently converted to certified organic agriculture. I visited to see how the trials had gone for both the organic peppermint and new herbs. The land is along the Columbia River and is considered high desert area, with dry conditions and high winds. With irrigation from the Columbia River, it’s very conducive to growing mint and other hearty plants such as the three herbs chosen. On my visit in 2013 when the conversion project was being launched, there was confidence this land would be productive, but there were concerns over weed control, water usage and plant quality since the land had been used for conventional production prior to conversion. But the results were very positive in all respects. The mint quality and yield was outstanding and superior to other organic fields in the area. Weeds were not a problem, which kept production costs down and allowed for a higher yield. The results of the field trials for the new herbs were also very positive, producing tall and robust plants with good color and aroma. Hand-sifted samples of the field trials were sent to the Frontier Quality Lab for evaluation and received high marks for quality. Full production of these items will begin this spring, with the first delivery of product expected by early fall. Given the success of the trials, we are now partnering with the supplier for field trials of organic culinary herbs, such as dill, cilantro and parsley. We hope to complete the trials this year and begin production in 2017. Frontier is also supporting the supplier in improving the drying of these items by assisting in the funding of a mechanized dryer. The faster, better drying will increase the overall quality of the products. We’re very encouraged by the initial success of this Well Earth project, and we’re excited about the future prospects of offering more high quality domestically produced organic herbs through the expansion of organic farming in the Pacific Northwest. About the Author: Dennis travels the world as a Commodity Manager for Frontier’s Global Sourcing team to meet with the growers who supply Frontier. He often coordinates donations through our Well Earth sourcing program for grower communities (commonly small villages) to provide basics we take for granted, such as medical care, education, water and electricity. In Iowa, Dennis is head of our Community Giving Program and travels to nearby towns to lend a helping hand to local organizations, charities and events. Last summer I went on a trip with Aura Cacia Educators Tim Blakley and Charlynn Avery to visit the source of several of our oils in Morocco. Our first stop was an organic farm near Khemisset we’ve been working with for over a decade. The farm is run by a French company but employs local workers for harvest and distillation. The manager, Phillippe, has been living on the farm since its inception and has impressive knowledge and experience regarding herb cultivation. When he speaks about the farm, you can feel his passion for working with the land. This supplier doesn’t trade and buy oils like other companies, but carefully selects areas and sets up long-term arrangements — investing heavily — with the farmers and communities. This fits perfectly with Aura Cacia’s preferred way of doing business — developing long-term partners at the source of our essential oils. The workers on the organic farm in Morocco enjoy ample paid time off, healthcare, representation to upper management and a higher wage than average farm workers in the area. While touring the farm, we saw the wild chamomile we purchase being distilled, the organic neroli flowers on the bitter orange tree and some of their new projects, including organic geranium and organic jasmine. We also saw how all the resources on the farm are used efficiently. For example, after distilling wild chamomile or bitter orange branches, the spent material is either composted or used as mulch at the base of the bitter orange trees. The farm uses drip irrigation to preserve water, and they reuse the water that cools the condenser. We walked around the farm asking questions and taking photos. We stopped and saw the distillation of the wild chamomile. The essential oil had a surprising variety of color — from yellow to greenish yellow — due to natural plant variation and time of harvest. We were quite impressed with the farm’s operations, its commitment to quality and its respect for its workers. The next stop on the trip was slightly to the north, near Fez — the part of the country and known for growing the best rosemary in the world. Rosemary bushes grew wild as far as we could see. Harvesters use hand sickles to cut the rosemary and bring it to the nearby distillery. Our supplier here is a family that has been distilling rosemary for three generations. We were greeted by the son of the man we had visited with a few years ago — the son is now fully in charge of the distillery. We saw how the rosemary is distilled to capture the essential oil, and we discussed its quality and the market conditions that are causing prices to rise. We enjoyed a beautiful meal at the end of the day— complete with traditional Moroccan tea — in the son’s home. Finally we traveled south toward Agadir to see the women’s cooperative where we buy organic argan oil. We’ve been working with this group of women since 2011 when Aura Cacia first introduced organic argan oil into its line of products. The women gather the argan nut from the thousands of trees growing in this area. They crack open the nuts, revealing the seeds that are then mechanically cold-pressed to produce the oil. Argan oil has been used for centuries by Moroccan women, both for cooking and in skin and hair care. Now that the western world has discovered its virtues, the women have a very lucrative business. This product provides much needed income for women in Morocco, where their options for employment are quite limited. And because the trees grow wild in this area, the women are able to work flexible hours and stay near their homes. We watched the women shell the seeds and use their recently updated cold-pressing machines to extract the oil. The oil is then filtered and sealed in stainless steel drums. They have photos in the entryway of the King of Morocco visiting their facility. The women are obviously happy with their jobs and proud of their work. We ended our Morocco visit by going up to the rooftop where we dipped bread into a delicious mix of almond butter, honey, and argan oil and enjoyed another another impressive tea service. 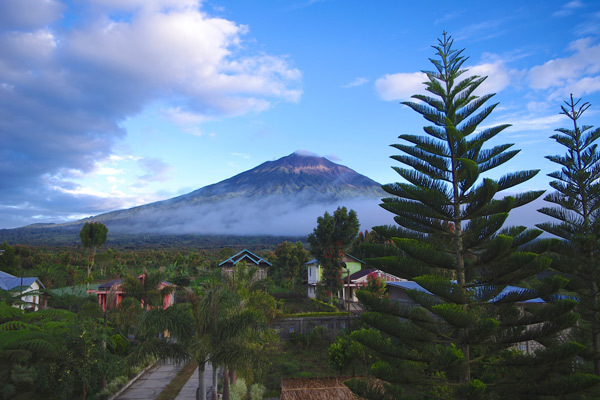 We boarded our plane later exhilarated with the experience of having visited these three top-notch suppliers and met the wonderful and dedicated people of their communities. About the Author: Jennifer purchases essential oils, raw materials and packaging for Aura Cacia. She enjoys traveling the world in search of goods that are high quality and sustainable, and that lead to healthy, happy lives for all those involved. Jennifer is currently pursuing a Master’s in Business Administration at the University of Iowa. Outside of work and school, Jennifer enjoys hunting for treasures in antique shops and doing home improvement projects. Frontier Co-op CEO Tony Bedard tries his hand at vanilla bean sorting at our Madagascar supplier’s facilities. I like local food. On our last visit to the weekend farmer’s market in nearby Cedar Rapids, Iowa, my wife and I bought produce and flowers, nut butters and jams, and even dishcloths and soaps from small, local farmers and businesses. On a regular basis, we shop from the roadside produce stand that we drive by on our way to visit the grandkids. One of the things I like about my membership in New Pioneer Co-op (my local food co-op) is that they champion local products. And it’s not just because the price is right that we’re thrilled when our friends with big gardens stop by with their overflow harvest — the taste of those vegetables from down the road puts trucked-in produce to shame. Besides the quality of local products, I like the community, social, economic and environmental aspects of local buying. The spices are sustainably grown. Okay, I can’t make the case that eating something that comes from nearly 10,000 miles away is minimizing food miles. But when it comes to something like cinnamon, I’m not going to find it locally grown. So short of simply not eating anything that doesn’t grow in Iowa, I have to make another assessment — I look at how sustainably foods that are unavailable locally are grown where they do grow. 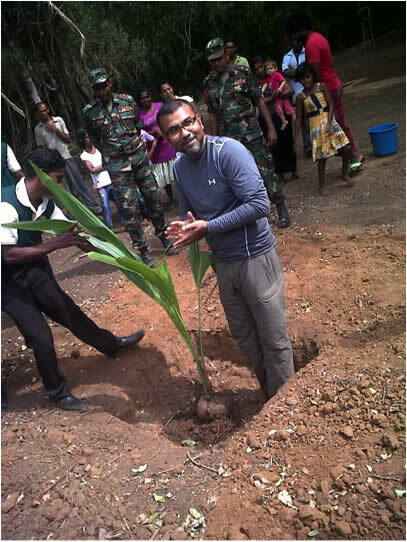 During the trip, I helped plant a coconut tree outside the second Organic Training Center Frontier Co-op has funded in Sri Lanka. It was a bit of an adventure — a trip to Sri Lanka from Iowa. And, it was certainly a long journey for me as I had taken a detour through India to see my parents before I with met up with Tony Bedard, our CEO, in Sri Lanka earlier this year. This was my first trip to personally visit a Well Earth® supplier. Our Well Earth sustainable sourcing program promotes the sustainable farming practices and production that our customers have come to rely on from us. As head of Quality at Frontier Co-op, I consider the connection to source a very important aspect in driving transparency from farm to table, and improving quality on a continual basis. 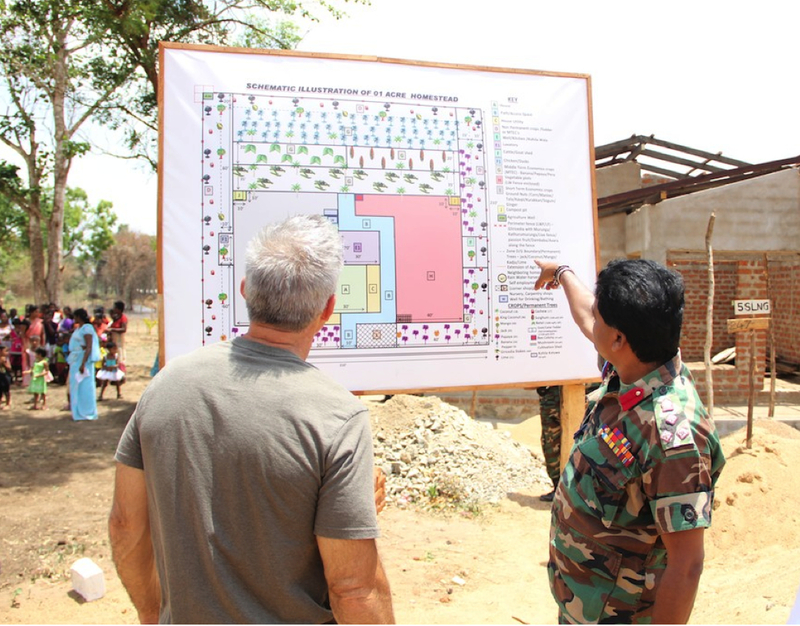 Frontier Co-op CEO Tony Bedard (left) reviews the layout of homesteads provided by Sri Lankan government. Ceylon cinnamon, which is sought after for its lighter, brighter taste, comes from the bark of an evergreen tree that is native to Sri Lanka. 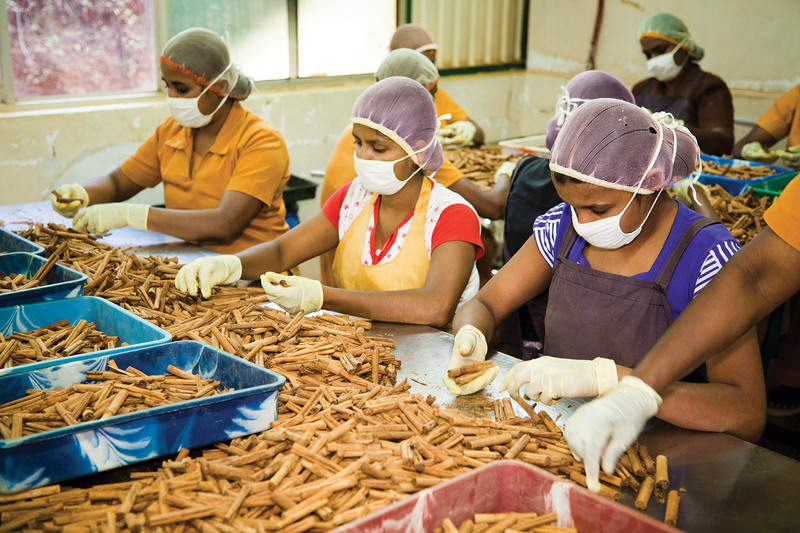 Frontier Co-op Ceylon cinnamon is Fair Trade Certified. Here, workers sort sticks for quality. The basic idea of Fair Trade certification isn’t difficult to grasp — guaranteed minimum prices, decent work conditions, and fair wages prevent the exploitation of poor farmers and farm workers. I know that without Fair Trade, farmers often have no other alternative but to take whatever, often small amount is offered for their products while farm workers – some of the most exploited in the supply chain – are often subject to harsh working conditions, discrimination, and other abuses. Fair Trade certification means farmers and farm workers can earn living wages for the crops they grow which in turn helps them support their families. The certification also demands humane work conditions, encourages sustainable farming practices and supports direct trade to eliminate exploitive middlemen. One of my favorite movies, The Man with Two Brains, has a scene where Steve Martin’s character is talking to the portrait of his deceased wife and asking her for a sign — even the smallest of signs, anything at all — to indicate whether he should marry a new love he’s come across. As he asks the portrait above the fireplace for guidance, the house starts to shake like a violent earthquake has hit, a voice out of nowhere says emphatically, ”No! No!,” and the portrait begins to spin like a roulette wheel on the wall. It all stops, and Martin implores, “Just give me a sign, any type of sign.” He then goes about marrying the new woman. “What does this scene have to do with the price of cinnamon in Indonesia?” you ask. We’re getting signs from all over the world that are about as subtle as the ones Martin’s character was getting from the portrait — signs that things are changing in the realm of spices. There’s not a trip that I go on where a farmer doesn’t express concern about changing climactic conditions and how it’s affecting his crops. Also, land is becoming scarce. Land that was once used for growing spices is now being utilized for food crops or alternative fuel crops like jatropha (an inedible, evergreen shrub cultivated in tropical and sub-tropical regions), switch grass and corn. Companies as well as countries are buying arable land in Africa and Asia so that they can feed growing populations and meet the need for more fuel. There is every indication that spice prices will continue to rise (they have risen in the marketplace by over 50 percent since 2008), quality will probably suffer, and overall availability will be hindered. The holiday season isn’t quite as sweet without cocoa — from your favorite chocolate treats to a mug of hot cocoa in front of the fire. To make the experience a truly joyous one, be sure your cocoa is produced without exploiting the people who grow it. 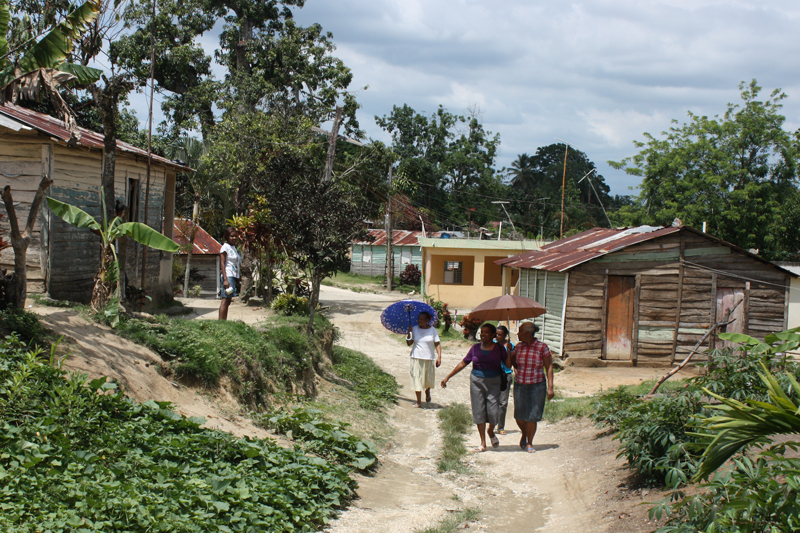 A small town in the Dominican Republic, typical of where some of Frontier’s Fair Trade Certified cocoa is grown. Chris Anderson, a commodity manager for Frontier, visited our cocoa supplier there earlier this year. Frontier’s three organic, Fair Trade Certified™ cocoa powders are sourced with the philosophy of sharing the goodness: the high-quality, organic cocoa that sweetens our lives also improves the lives of the farmers growing it in the Dominican Republic and Peru. 1. Keeping in direct contact with local growers of our cocoa. Fair wages, safe working conditions, access to education and healthcare, GMO-free crops — these are some of the important things you support when you buy products that are Fair Trade Certified™. But beyond the seal and the premium price, how does Fair Trade actually work to make a difference in communities worldwide? It’s all about building strong local organization among individual farmers. For the past six years, Frontier purchasing manager Kai Stark has been involved in sourcing more than a dozen Fair Trade Certified (through Fair Trade USA) spices from growers in Sri Lanka through the farmer groups Small Organic Farmers Association (SOFA) and Marginalized Organic Producers Association (MOPA). 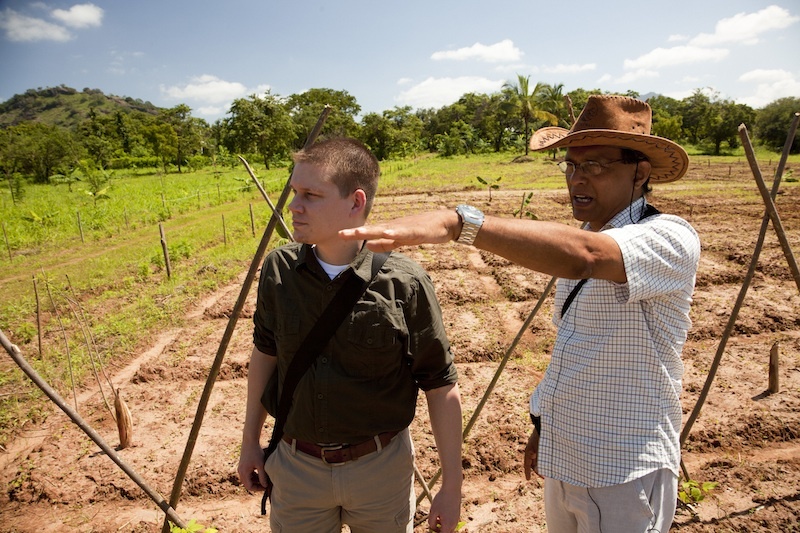 Kai (left) visiting an organic farm in Sri Lanka. We recently talked with Kai about how these groups — and by extension, Fair Trade — make a difference for farmers in Sri Lanka. You’ve visited this group of farmers, located in the central hills of Sri Lanka, multiple times over the past several years. What makes them unique? The farmers that we work with are small landholders who farm one or two acres. Rather than growing spices in large-scale monocultures — plantations — these farmers are devoted to intercropping. This means that you’ll see many crops growing in just one or two acres, with the different crops supporting each other. You’ll see clove trees with pepper vines growing up their trunks, for example. This was the enthusiastic greeting I received from fifty children in unison when I arrived at their new school in the northern Madagascar town of Ambohimena last fall. I was visiting to attend the dedication ceremony for the school, which was built through funding from Aura Cacia’s 1% Fund. 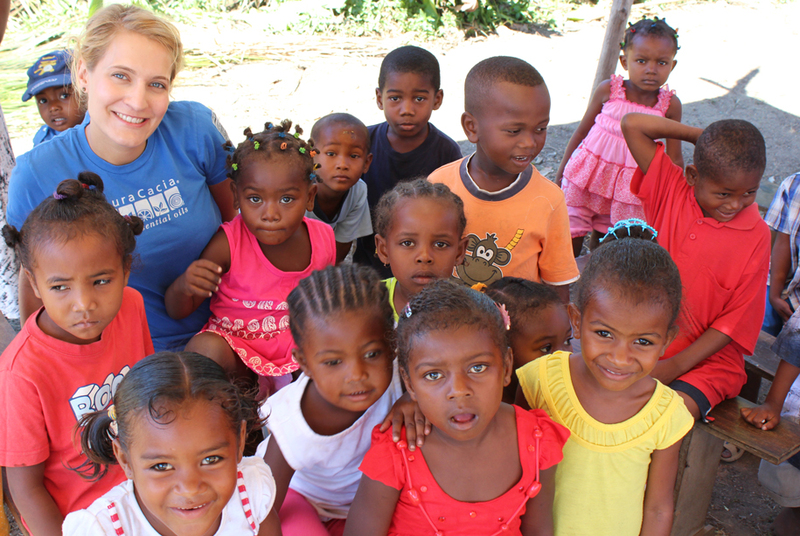 Jennifer Ferring poses with students at the Ambohimena school, built for the children of ylang ylang harvesters in Madagascar through the Aura Cacia Organic 1% Fund. The fund gives back 1% of sales on Aura Cacia’s organic products to support organic farmers and their communities. In celebration of the 20th anniversary of the Frontier tallgrass prairie, we’ve planned several enhancements to the prairie and its surroundings. 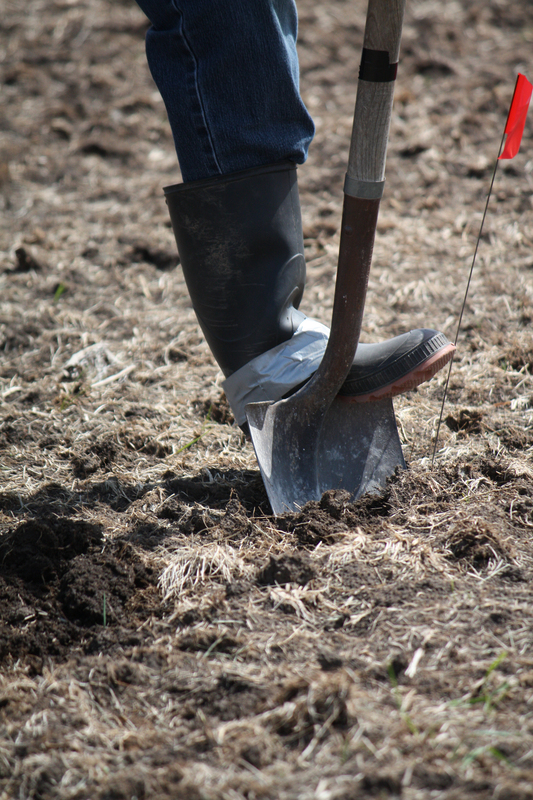 First, we’re planting an additional six acres into prairie. The prairie was originally planted to include these six acres but was used a few years later to grow herb crops. It’s been in grass for the last dozen years; we’re excited to bring it back into tallgrass prairie. We’re ready to plant as soon as it is dry enough, with an eight prairie grass mix: big bluestem, sideoats grama, Indiangrass, Virginia wild rye, little bluestem, Canada wild rye, rough dropseed and sanddropseed, and two legumes — Illinois bundleflower and partridge pea. Early next spring, we’ll plant wildflowers into the area. We hope to add flowers that aren’t in our current prairie so we can increase the diversity of blooms.